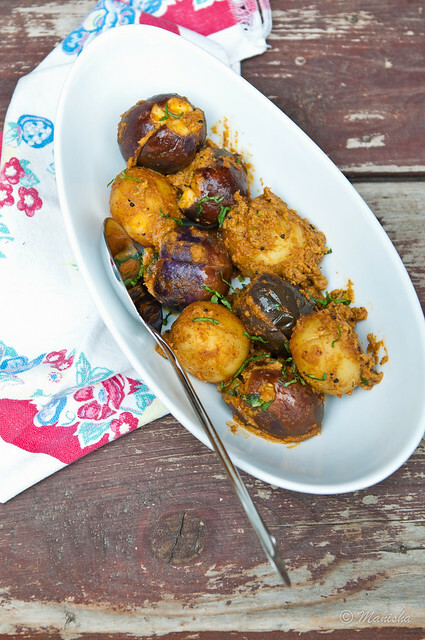 With that in mind, I thought it would be very apt to share a very traditional recipe from my home state of Maharashtra, Bharli Vangi or stuffed Indian eggplants, even if this post is a week after the fourth. I based my recipe on Kamlabai Ogale's recipe in Ruchira. I buy my 'mini' eggplants or small Indian eggplants at my local Indian grocery store. 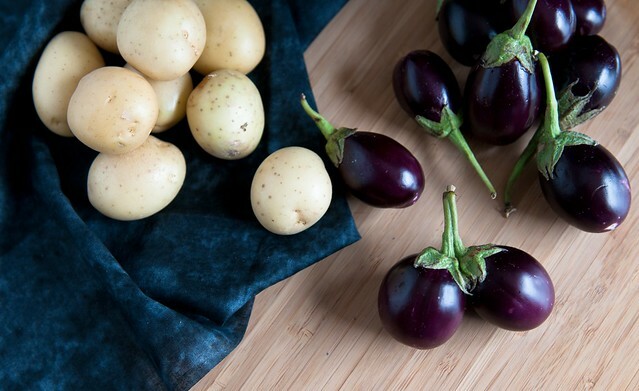 Once I have selected my eggplants, I find the bin with small yellow potatoes and try to find potatoes that are almost the same size as the eggplants. Traditionally, bharli vangi is made with copra or dried coconut. This can be purchased whole or in large chunks at Indian grocery stores. 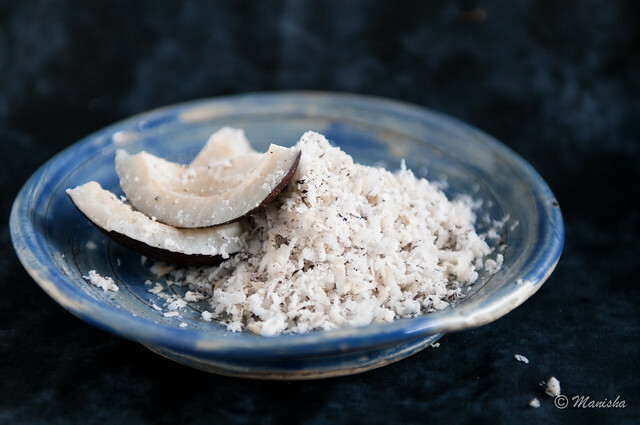 If you cannot find copra, the next best thing to use is unsweetened desiccated coconut, which is dried shredded coconut. I prep my eggplants slightly differently from the traditional method, where the stalk is left intact and the eggplant is sliced in a deep 'X' from the bottom towards the top, leaving it whole. Instead, I remove the stalk because it is not necessarily in great shape after traveling thousands of miles from Florida or Hawaii. Sometimes, the part of the eggplant right under the stalk isn't particularly endearing either, which makes me want to inspect it and cut some of it away instead of cooking it sight unseen. I then slice it from the top towards the bottom, as if to quarter it, but leave it whole. In general, the smaller the eggplant, the less bitter it is. 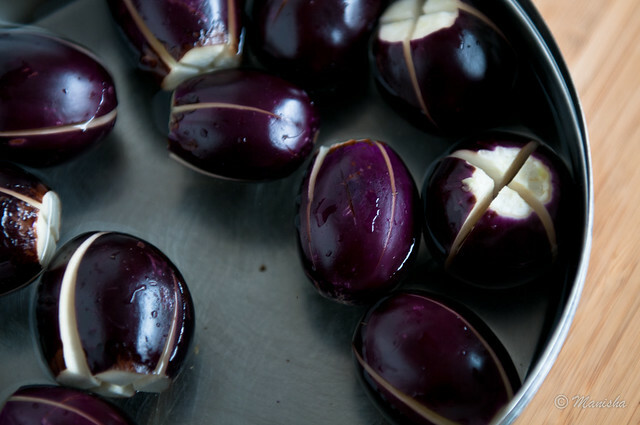 Even then, most Indian cooks advocate soaking chopped or sliced eggplant in salt water. 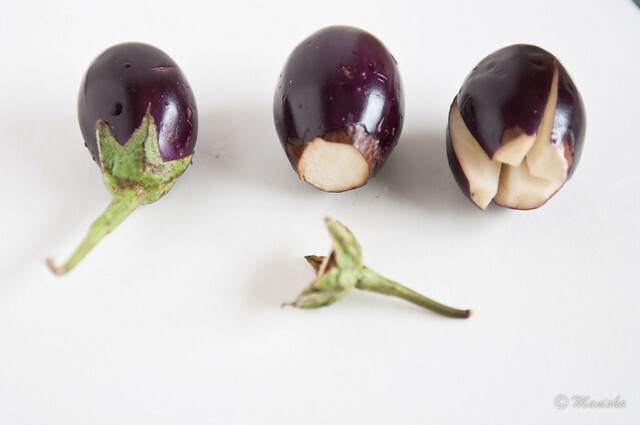 This is supposed to draw the bitter flavors out of the eggplant as well as prevent the eggplant from absorbing too much oil and becoming greasy. Truth be told, I haven't noticed much difference in flavor whether I soak it or not and since I do not deep-fry the eggplant nor do I use a lot of oil, there isn't much chance that the eggplant will become greasy. But, I soak them in salt water anyway. What I can tell you is when I follow this procedure, the eggplant does not darken in color once sliced and exposed to air. I soak potatoes in salt water for the last reason -- so that they do not discolor. 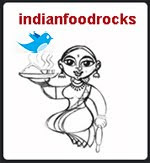 Peanuts, sesame seeds, dried coconuts, coriander seeds and cumin seeds are toasted to coax their oils to be released. The warm nutty fragrance of this mixture can be quite heady. Once cooled, this goes for a spin in my spice grinder and, unfortunately, turns into a greyish unappealing mass. But, plow on, my friends, for the final result is worth the effort. Add goda masala, red chile powder, tamarind pulp and jaggery to this grey mass and watch it come alive. After this, it is a breeze. 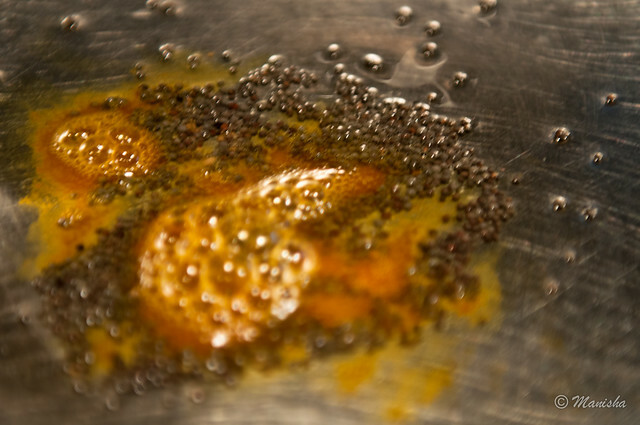 A simple phodni of mustard seeds, hing and turmeric powder sets the stage for this dish of complex flavors. 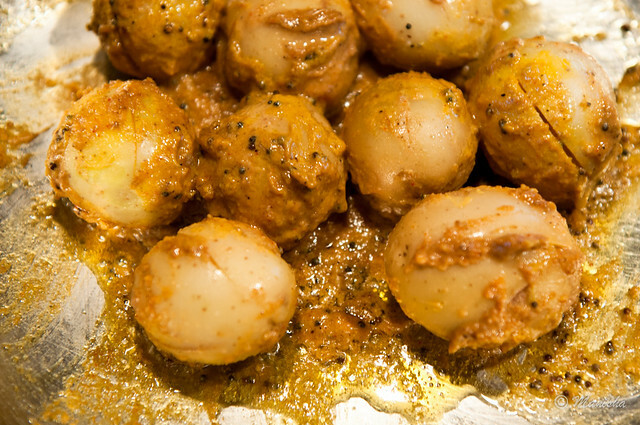 The very first time I made Bharli Vangi, the potatoes did not cook in the same time as the eggplants did. I learned the hard potato way that these need to be added to the phodni and cooked until almost-done and only then should the stuffed eggplants be added. It helps to add about 1/2 cup of water, or more, at this stage. Once the potatoes are almost-done, I add the eggplant followed by another 1/2 cup of water. I cover the kadhai with a lid that can hold some water. I add about 1/2 cup to the lid. This helps recycle the steam released from the masala back into the dish and enhances the taste. I turn into a little child when I cook this dish. I keep stealing the masala as the vegetables cook. 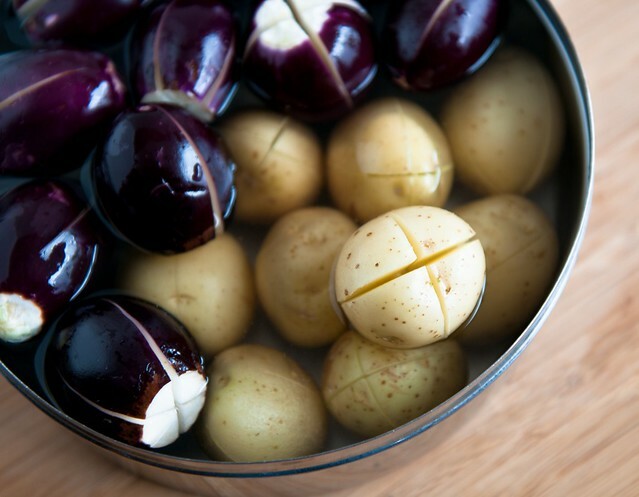 Prep eggplants by removing the stalk and slicing them with a deep X, as if to quarter but leaving them whole. Soak in salt water. Prep small yellow potatoes in their jackets in the same manner. Soak them in salt water, too. Toast peanuts, sesame seeds, dried coconuts, coriander seeds and cumin seeds on a cast iron skillet on medium-low until fragrant and light brown in color. 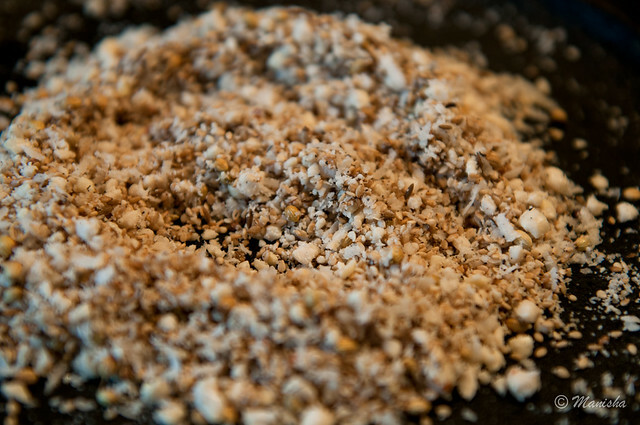 While this mixture is being toasted, soak tamarind pulp in warm water and coax into a thick pulp, discarding fibers and pips. 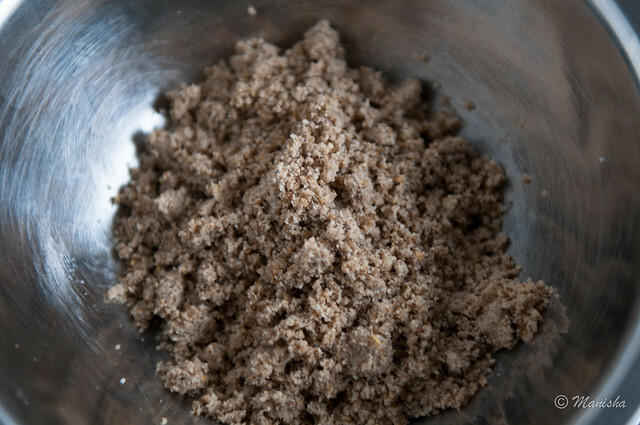 Allow the toasted mixture to cool and then grind to a fine paste. 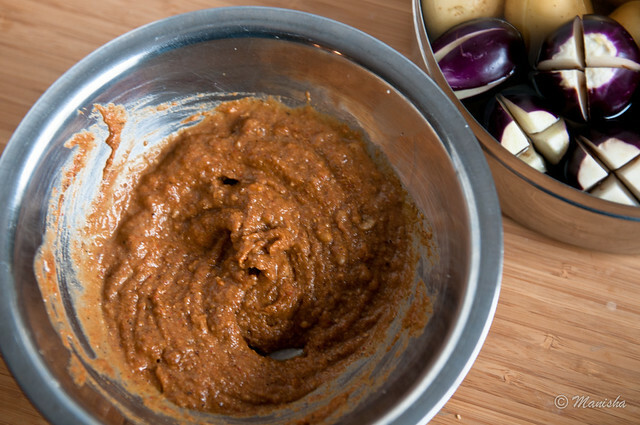 Add goda masala, red chile powder, tamarind pulp and jaggery to the ground mixture. Add salt. This is your masala. Remove the potatoes from the salt water and stuff with half of this masala. Try not to break the potatoes apart. Heat oil in a kadhai or wide saucepan. When it shimmers, add mustard seeds. When they pop, add asafetida, followed by turmeric powder. Turn the heat down to low. Quickly add the stuffed potatoes to the seasoned oil. Add about 1/2 cup water. Cover and cook until the potatoes are almost done, stirring occasionally. About 15-20 minutes, depending on the potatoes. Most of the water should have evaporated by this time. 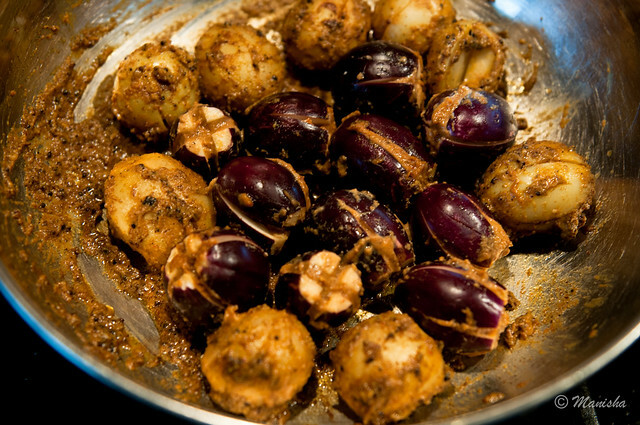 Discard the salt water and stuff the eggplants with the remaining masala and add to the kadhai. Add about 1/2 cup water, cover and cook until eggplants and potatoes are cooked completely. About 15-20 minutes more. Once done, garnish with chopped cilantro and serve hot with rotis. Take a quick picture of the dish with your worn fraying kitchen cloth, on your front stoop that badly needs a stain but works very well for that distressed generic food blogger picture, raise a toast to me and enjoy bharli vangi with your family! My family prefers the version with fresh grated coconut but I think the true flavor of bharli vangi lies in the one made with dried coconut. Whichever way you make it, I hope you enjoy this dish from the heart of my home state as much as I do. I must say that I didn't expect the naturalization ceremony to be anything but perfunctory because, really, it doesn't change who I am. 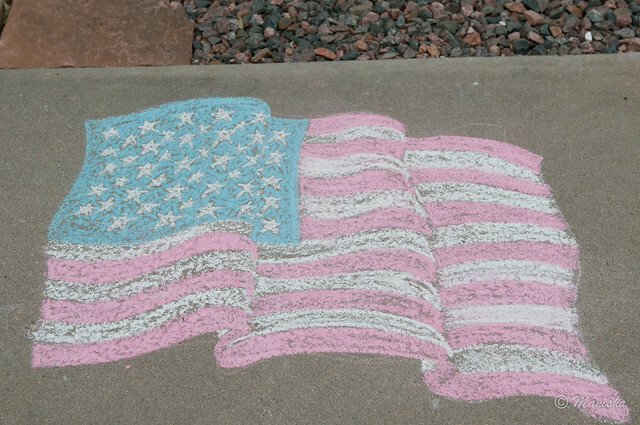 I would prefer to be a citizen of the world but for as long as there are political boundaries between nations, I know I will need to choose. And choose we did because we make our life in this country and, as LBJ rightly said, the vote is the most important instrument devised by man and I wanted to exercise mine. I was, therefore, not prepared for that tangled ball of emotion that suddenly made its appearance in my throat as I stood there, sharing the same milestone with about hundred other people I did not know. We smiled at each other through our tears, shaking each others' hands in congratulations. Some filed out immediately as they had jobs to get back to while others, like us, stayed to take pictures to document becoming citizens of the United States. 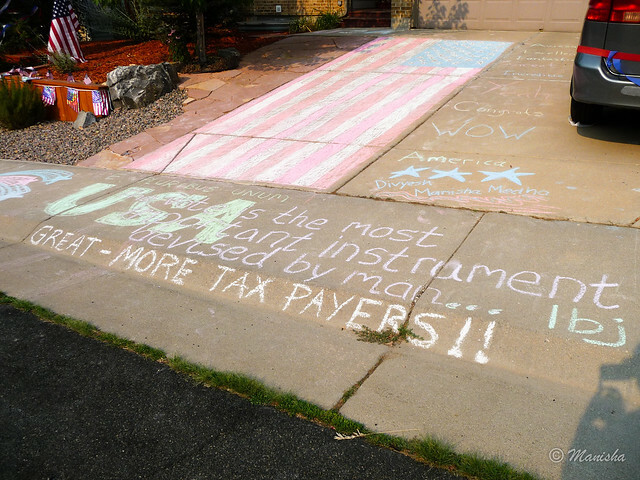 If you know someone who recently became a naturalized citizen, I hope you can throw them a party on July 4th just like my neighbors did for us! Beautiful picture of the flags. This is one delicious recipe. Thanks for the tip on cooking potatoes first! Averted tragedy. Drooling!, looks so good. You have got amazing neighbors Manisha. Congrats and best wishes to you all! 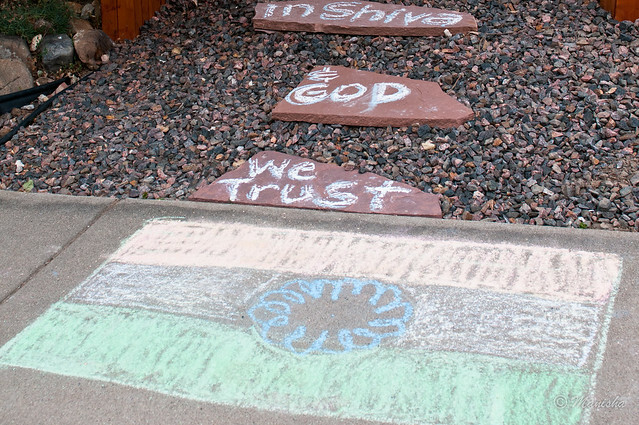 Manisha - So many good things in your post today! Firstly Congratulations. 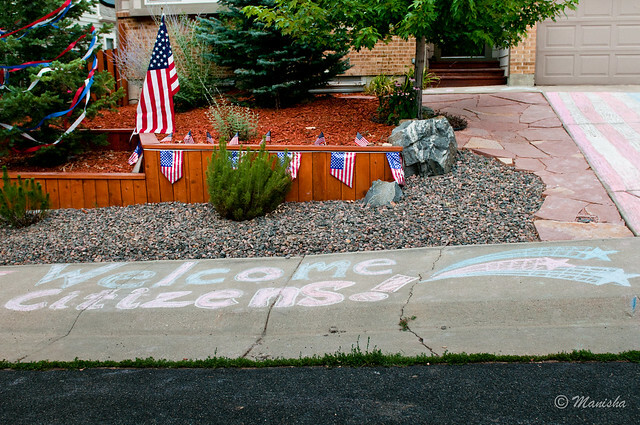 Excellent way to become citizens of a country where you have such great neighbours. Loved the write up on what the officer said when he handed you the docs. Secondly, the recipe. Been a family favourite for far too long. Bharli Vangi. Goes amazingly well with a well made Bhakri. And lastly, your line "I turn into a little child when I cook this dish. 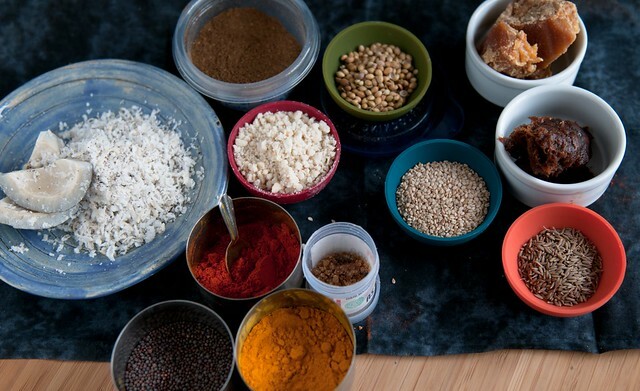 I keep stealing the masala as the vegetables cook." Delightful. That's the way it should always be. Ive usually seen my mom make "bharli vangi" in teh pressure cooker but I like the kadhai method much better.. the veggies retain a nice firmness. This reminds me of visits to my maushi's house - who married into a deshasth family and her version was fiery hot unlike the sweeter version we karhades made. So yummy and congratulations on being naturalized citizens! !